Netanyahu is nothing but a murderer. In Israel, he and his IDF gangsters use tear gas and live ammunition on people who are throwing stones because their land has been stolen from them. 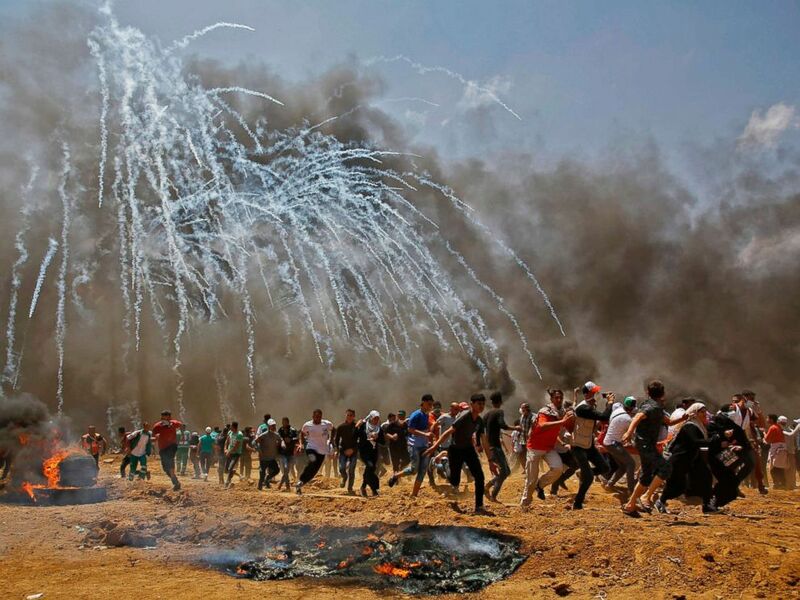 Israel calls this self-defence. Anyone who stands idly by without at least speaking out is complicit in murder, most particularly our political leaders. If the British Parliament fails to act on this it no longer has any legitimacy. If Theresa May fails to act she bears personal responsibility and cannot be immune from revenge. What Is This Alleged Anti-Semitism In The Labour Party? Is It A Secret? Does It Even Exist? London, UK. Friday 5th September 2012. ‘Freedom for Humanity’ a street art graffiti work by artist Mear One aka Kalen Ockerman on Hanbury Street near Brick Lane. 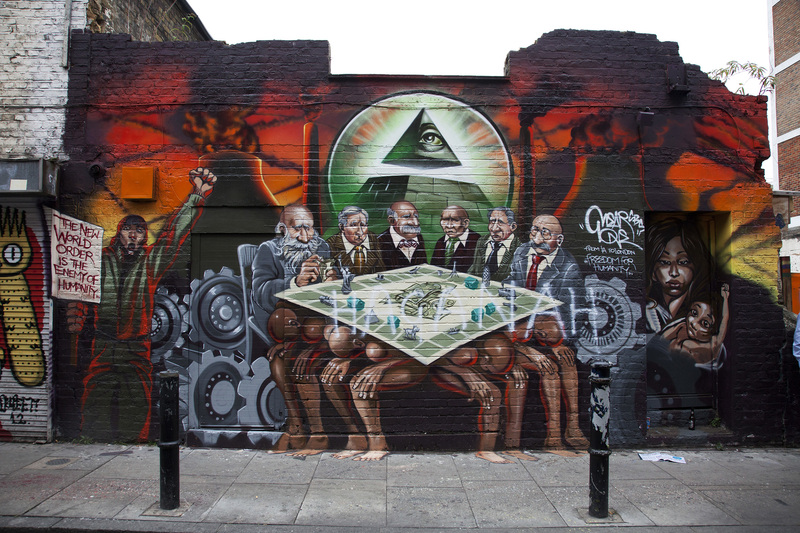 Tower Hamlets has ordered that the mural be removed as the characters depicted as bankers have faces that look Jewish, and is therefore antisemitic. My regular readers will know that I am no supporter of the Labour Party but I am bemused by the wall-to-wall coverage about what you would think is an extremely serious issue. We have been given absolutely no explanation at all of what this is all about. The only substance seems to be that in 2012, Corbyn commented on a Facebook post of a mural in East London which was about to be whitewashed over. Apparently he agreed that as a piece of art it should be left alone. Perhaps he didn’t look at it closely enough? I don’t know and I really don’t care. Ferreting around in people’s old social media posts used to be the preserve of obsessive nutters, trolls and sad young wannabe journalists with nothing better to do. Now it seems to be one of the BBC’s main ‘news’ sources. If this mural is the sole reason for all this hyperbolic coverage, what exactly is the matter with the mural? 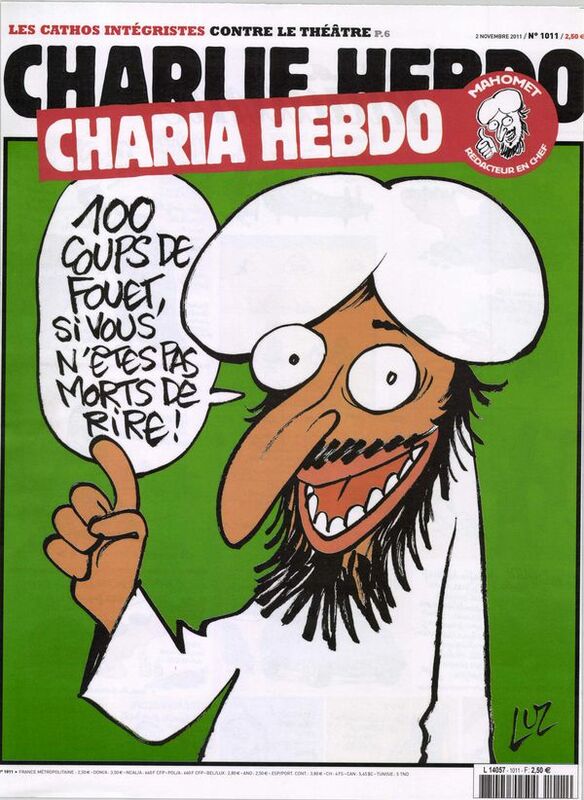 It lampoons some caricatures of Jews but it wasn’t long ago that we were encouraged to permit lampooning of images of Mohammed as free speech. This is clear bias, a ridiculous amount of coverage and yet more proof that the BBC is increasingly focused by lobby groups for minorities to the detriment of the majority. As for the Labour MPs sabotaging their party in puerile demonstrations outside Parliament, what is it all about? I asked on Twitter, “where and what is this anti-semitism” and I received just a couple of replies both referring me to the Twitter feed of a Jack Mendel who describes himself as the Web Editor of Jewish News UK. The pinned tweet which is supposed to justify this hysteria can be seen here. There is nothing to see. It’s a conspiracy theory more suited to a spotty, adolescent 14-year old locked in his bedroom stinking of smelly socks than anything remotely serious. ‘Witch hunt’, ‘McCarthyism’, call it what you will. These allegations of significant antisemitism are a smear campaign by an irresponsible BBC and the right wing press. Anyone who denies the Holocaust is simply a fool and anyone who discriminates against those of the Jewish faith is just a sad idiot – but it’s not racism, religion is a choice. On the evidence, and remember I am no supporter of Corbyn, the far more likely explanation is that this is a smear campaign which is really about the righteous opposition to the war criminal state of Israel and its apartheid and genocide against the Palestinian people. How Much So-Called ‘Anti-Semitism’ is Actually Opposition To Israeli War Crimes? It suits supporters of Netanyahu’s gangster regime to characterise any and all opposition to it as anti-semitism. It’s also true that much of that opposition and emotional outrage is badly framed and expressed so that it can be easily or deliberately misinterpreted as opposition to the Jewish people and their religion. But the Israeli regime itself plays fast and loose with the confusion between state, race, nationality and religion. It twists and distorts anything to justify its apartheid policy and genocide of the Palestinian people. Personally, I see very little anti-semitism. In fact I cannot remember the last time I saw any words, behaviour or actions that could properly be described as such. On the other hand there are daily examples of the brutal discrimination, oppression, murder, land theft and extra-judicial execution of Palestinians. So I call total balderdash on the invented stories of anti-semitism within Labour. In this instance, I believe Jeremy Corbyn and Shami Chakrabati are absolutely in the right. Of course, there are the loony left extremists in Labour who are a danger to the whole of our society. They undoubtedly push their delusional agenda of a Jewish banker mafia but they are bonkers anyway. We all have to deal with their idiocy on a daily basis. 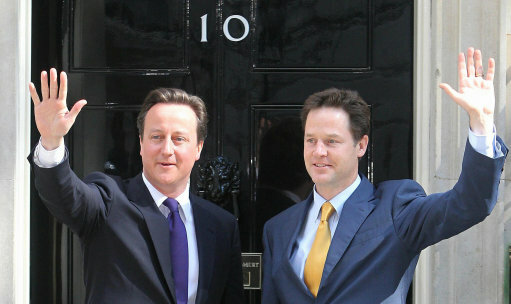 The far greater danger they pose is their already-achieved elimination of any effective parliamentary opposition. No, the accusations of anti-semitism, including from the Home Affairs Committee, come from the pro-zionist apologists for Israeli war crimes. 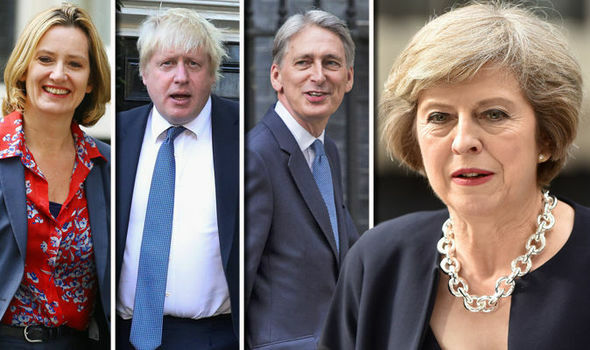 I really don’t believe that amongst decent, honourable British people of all political persuasions, there is any significant anti-Jewish prejudice or actions. Obviously I’m not saying it never happens but it’s largely Israeli government propaganda. The answer is to root out the corrupt Israeli lobby in the UK Parliament and in US Senate and Congress. Stand up to Netanyahu and the despicable conduct of so many in the Knesset. Give the Israeli people back the freedom to live in peace with their neighbours and for the nation to flourish without the hatred and oppression which constrains it today. Bullying Oaf, John Mann MP, A Perfect Representative Of Netanyahu’s Israel. The disgraceful, thuggish behaviour of John Mann in his assault of Ken Livingstone happens every day in Palestine. There, it may be heavily armed IDF soldiers dealing with Palestinian children. Or an Israeli demolition team throwing elderly grandparents out on the street before sending in the bulldozers to destroy their home. It’s often far worse: a young Palestinian man taken out of sight and summarily executed simply because the IDF know they can get away with it. John Mann’s conduct is right in line with the aggressive, brutal arrogance that characterises the state of Israel. The pathetic response of the Labor Party, so many spineless, politically-correct MPs ganging up against Livingstone, alleging that his reference to Hitler’s 1933 Haavara Agreement with Zionist German Jews is somehow ‘anti-semitic’. The readiness of these cowards to jump on this bandwagon is contemptible, as are the underhand attempts to smear Jeremy Corbyn with the same charge. 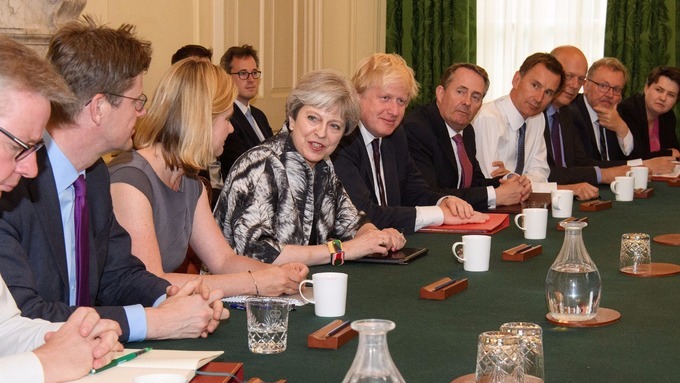 The Tory Party is already well under the Israeli cosh and subservient to its two-phase strategy, donate and bully, donate and insist on a blind eye to Israeli war crimes. Now Labour, in utter shambles between the Blairites and the hard left, are vulnerable to the most crafty, insidious political gameplayers of all. Israel is a nation intent on subversion of western democracies at every level while imposing its brutal, racist, apartheid policies at home. All honourable Israelis; Jew, Christian, Muslim and those of no faith, must rise up against this monstrous regime that is largely responsible for the Middle East conflict and now threatens the cohesion and stability of western nations. The corrupt influence of the pro-Israel lobby must be rooted out from our political parties and all parts of our society. Where Was The Outrage When IS (Israeli State) Murdered 3,000 In Gaza? We really have twisted priorities in our world. Nothing can excuse or justify the events in Paris but much more death, brutality and injustice has been inflicted on Palestine by Israel and its conduct drives much of the extremism that now preoccupies us. We stand idly by while this outlaw state, in breach of 64 UN resolutions, oppresses a whole nation and routinely uses high technology weapons, phosphorous bombs, F16s and tanks against an heroic resistance armed only with pop guns and fireworks. Israel defies every decent standard of behaviour, every moral and every ethic that we claim to support in our outrage against the evil that took place in Paris. Why are we not using drones to drop Hellfire missiles on Netanyahu’s head? Why is the Knesset not regarded as the headquarters of an evil, terrorist ‘so-called’ state when that is exactly what it is? If we took a moral stand, refused to trade with an apartheid state that engages in child murder and land theft, defended the women and children of Gaza, perhaps it would be more difficult for the monsters of Raqqa to recruit supporters? Until we become more consistent and fair then we can only expect resentment to grow. We can never defeat the evil of a perverted idea of Islam until we root out the murdering terrorists of Israel.